I've already decided on my next project after the Rebecca lacy sweater is done. It's the Sunrise Circle Jacket, a web-only pattern from Interweave Knits. I'm really drawn to this pattern for some reason. I love the styling and the fabric of the yarn. It reminds me of a Mandarin-collared Chinese jacket. It also looks to be a real challenge--the pattern is about seven pages long! I just ordered my Karabella Soft Tweed from Flying Fingers Yarn Shop. 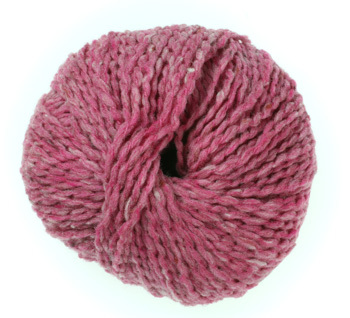 This rose color was on sale for only $5.69 a skein compared to the normal retail price of around $9. That probably had something to do with my decision too!